P&M Distorted is a smooth distortion effect with versatile EQ and tone controls. Add this to an track where you need extra crunch or grit. Use the built in EQ for additional tone sculpting. The Color knob allows you to dial in the perfect tone for your distortion while the Mix knob in the upper left corner allows you to adjust the dry-to-wet mix. - Drive : Adds more distortion drive. - Low Cut : Cuts all frequencies below a certain point. - Highs : Cuts all high frequencies above a certain point. 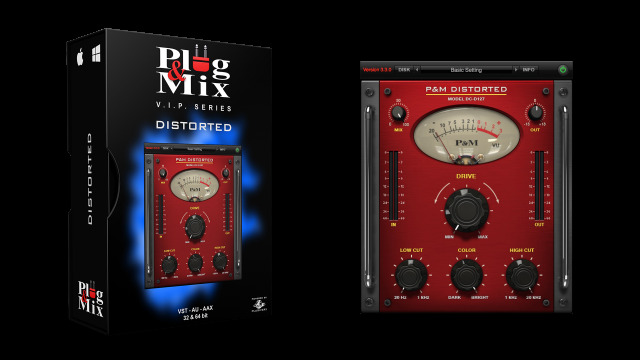 - Mix : Dry/Wet Mix of the plug-in.